- Manheim invests $100+ million in its Digital Marketplace. 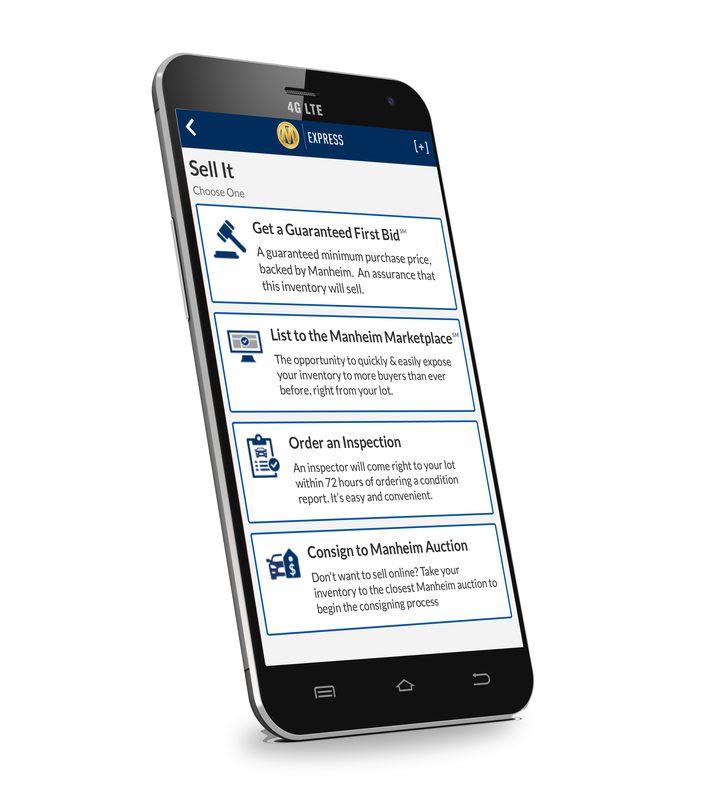 - Manheim ExpressSM mobile app enhancements benefit wholesale vehicle buyers and sellers. - Full-service concierge service for Manheim Express mobile app coming soon. ATLANTA - Manheim continues its mission to deliver the industry’s top destination for wholesale vehicle buyers and sellers and will invest over $100 million in its digital marketplace from 2018 through 2019. Manheim has been enhancing its digital platforms, from OVE to RMS Automotive and Simulcast—giving dealers a faster, easier and more efficient experience wherever and however they want to do business. The latest enhancements include the launch of the Manheim Express mobile app, and the forthcoming launch of a full-service concierge service, which will offer specially-trained advisors to help dealers maximize vehicle listings and profitability. Online inventory channels help dealers and commercial sellers develop more cost-effective wholesale operations, reach broader audiences and increase their satisfaction with transactions. Increasingly they are embracing this way to do business, recognizing they can move inventory faster online with 24/7 access to buyers and sellers. In fact, Manheim experienced significant digital acquisition growth with 45 percent of all vehicles sold to a digital buyer during the first half of 2018, up from 39 percent in 2017. On OVE, Manheim’s leading open digital marketplace, Manheim has invested in a complete overhaul of the vehicle search experience, bringing faster performance and greater personalization. The site now learns from each user’s searches and purchases to present the most relevant set of results possible. Sellers will see a significantly improved selling experience in 2019 as well. Enhancements will cascade to other platforms in the Manheim Marketplace, including Manheim.com and Simulcast in the coming months. Commercial sellers who desire a branded private digital store benefit from faster time to sell and a larger, national bidding audience online through RMS Automotive. The enhancements serve sellers and their buyers alike, with a mobile friendly buyer experience, direct integration with advanced Decision Support tools, greater level of personalization and a high degree of configurability, allowing for quicker turn-around. Manheim has also begun integrating RMS Automotive’s platform with key systems to support visibility and management for cars located both on dealer lots and at Manheim locations to support multi-channel sales. Manheim Express App for Android now available for free download on Google Play. Full-service concierge service that will provide clients a dedicated person who will partner with them on full lifecycle management of listings in the app. An updated and improved imaging process that delivers improvements to the revolutionary 360⁰ imaging that only Manheim Express offers. Integration with vAuto Provision to help dealers make smarter inventory decisions and list their inventory into the Manheim Marketplace faster and easier than ever before. Dedicated mobile buy-side experience, making it easier for dealers to buy with Manheim – any vehicle, anywhere, anytime. Inventory management dashboard that allows Manheim Express dealers to more easily manage their listings and redeem Guaranteed First Bids. For more information about Manheim Express, go to ManheimExpress.com.